When you think about student achievement in schools, do you wonder what common trait appears in every high-performing school? Is it dollars spent per student? Discipline? Socioeconomic status? Technology? No, it is none of those things. The biggest factor considered to be the “Great Equalizer” in schools is HIGH EXPECTATIONS in both ACADEMICS AND BEHAVIOR! Hands-down! Our students will rise to the challenge of our personal expectations. When we (teachers) set high expectations of our students, we act differently. We call on every student, wait longer for think time, and give students opportunities to succeed. (Marzano). Our students’ success begins with our own mindset about the intellect and ability of our learners. Carol Dweck’s book, Mindset: How You Can Achieve Your Potential, says that when educators teach with a growth mindset, all students progress and develop to a higher degree. By the time students reach high school, they know the rules and how to behave. My syllabus handout communicates my expectations for classroom behavior, student performance, consequences, and opportunities for additional help. These are the non-negotiables, spelled out! I don’t waste time reading to them on day one, they don’t need a lecture! Be sure to greet students at the door. One the first day, you can give your students my FREE “Brain Training Activity” which is a self-checking, circuit-style assignment. It breaks the ice and sets the tone for your academic expectations. Be sure to download your free copy! I have three levels, ALGEBRA 2, PRECALCULUS, and AP CALCULUS. Student-centered activities engage all learners. In my classroom I like to use task cards, stations, scavenger hunts, and card sorts throughout the year. Teacher-directed instruction is mainly used for new content. My students take notes on Foldables© or Scaffolded Guided-Notes. There is no free time in math class. Students need to know that you believe in them, even when they lack a personal sense of confidence. When you finish a unit test, have students complete test corrections and collaborate with peers, in order to better understand those difficult concepts. This will give them an opportunity to succeed; and, they can earn partial points for their reworked corrections. It provides a chance to speak mathematically among their peers and helps to promote a sense of community within your class. Do you want more STEM Classroom Tips? Freebies? and a TPT Gift Card Giveaway? Keep reading. . .
Set the stage for success on DAY ONE! You have 179 days to find the “Goldilocks-Size” work load that fits your learners “JUST RIGHT!” Challenge them to WALK IN WORKING every day. To keep students motivated throughout the year, they need to feel that the tasks you assign are achievable but challenging. 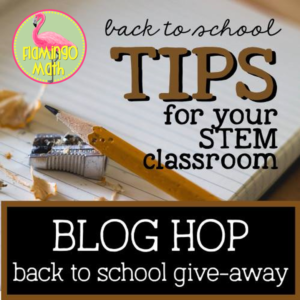 Be sure to visit these other STEM Teacher-Authors in our blog hop for a chance to win a $50 Teachers Pay Teachers Gift Card. You will also be eligible to win products from my store valued at $10 for your entry. Winners will be announced on Monday, July 30th. Everyone has something wonderful to share! Love the Circuit Style activity for the first day! Thanks Andy, I hope you find it useful! Teach “bell to bell.” I totally agree. This sets the stage that you think your class is important and that students have much to learn. Excited to use this circuit in my class! I love the idea of greeting students at the door. Creating those connections is so important. Love the idea of setting high expectations for everyone. It really makes a difference! I plan to do math from day 1 in my class this year. Your circuit activities are a great place to start.